John Davis, professor and associate director of the School of Forest Resources and Conservation in the University of Florida’s Institute of Food and Agricultural Sciences, has been named associate dean for UF/IFAS research. 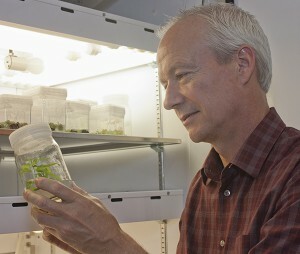 Davis earned his Ph.D. in Plant Breeding and Genetics / Forestry from Michigan State University in 1989, and joined UF/IFAS after a postdoctoral fellowship at the University of Washington. He now specializes in genomics of ecologically important species and their interactions, with a majority research appointment in the School of Forest Resources and Conservation in UF/IFAS. Davis has served as graduate coordinator for two intercollegiate degree programs at UF – Genetics & Genomics, and Plant Molecular and Cellular Biology. He also serves on the executive committee of the UF Genetics Institute, which supports UF faculty conducting genetics research in all colleges and units. Davis’s research focused on genome analysis of ecologically important organisms and its application to sustainable forest health. He published 67 peer-reviewed journal articles, 45 technical reports and six books or book chapters, and received $4.5 million since 2000 in external research funding from federal and industry sources. Davis served on 51 graduate student committees, as Chair for 14 students and member for an additional 37. He mentored five postdoctoral advisees and 20 undergraduates on research projects. Davis served as co-director of the Forest Biology Research Cooperative to support its mission of sustaining healthy forests, through establishment and analysis of outdoor “living laboratories.” He served as reviewer for proposals and as a Scientific Advisory Board chair for Genome Canada. He is currently a member of the steering committee for the Forest Health Initiative, which is exploring biotechnology solutions to global forest health challenges. Davis said he is honored to take on the role of associate dean for UF/IFAS research. “I am eager to support the world-class research conducted by UF/IFAS faculty as a member of Dr. Burns’ team,” he said.